I think this is one of the classes I was most looking forward to; my home cake decorating up until now has been haphazard at best. 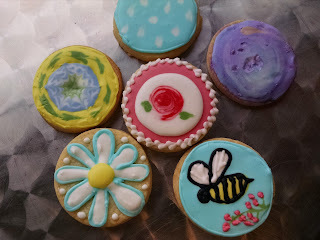 Probably because I never really piped anything at home and today was all about piping frosting and royal icing. However, before you get any notions that making frosting roses is easy let me assure you, it is NOT. We started the day by making yellow cake and cookies, basic recipes, so we could practice our decorations. Then we made royal icing and we each got to choose a color and then make roses. Granted, the icing wasn't stiff enough, even with adding more sugar, and it was a rainy day which likely made it more finicky. But my roses were UG-LEE! I did a little better with the apple blossoms and, because I had purple frosting, I made violets. Then it was time to work on the buttercream frosting for the cakes. We made a Swiss buttercream, as we started the egg whites and sugar in a double boiler and then transferred that to a mixer; from there the technique is the same in that you beat it until it's cool and then add the butter. As we made a lot of buttercream we were in serious danger of overflowing the larger mixer. Ultimately we had to split the batch for it to beat properly. 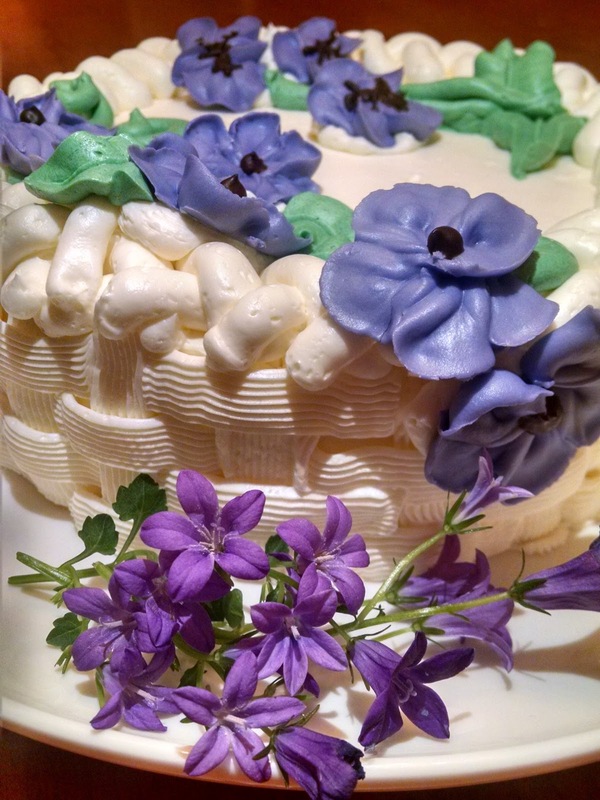 The buttercream was left white so we could work on the cakes. 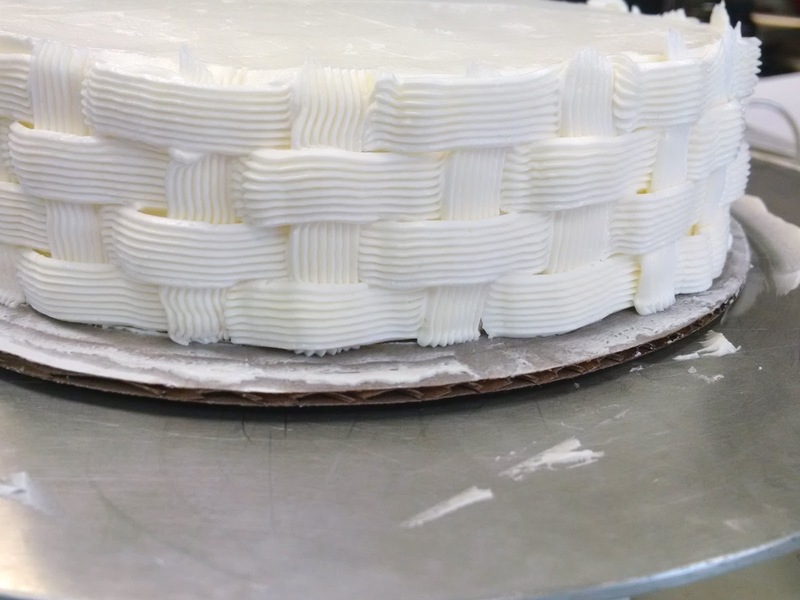 First we assembled the cake - trimmed layers with about half an inch of buttercream between the layers. Next was a crumb coat and then back in the freezer to chill briefly. After that, the cakes were frosted and the sides were smoothed. 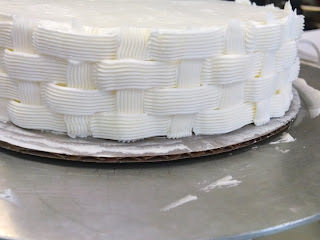 Chef showed us how to do a basketweave on the sides and we got to pick how we wanted to finish the top edge. I chose a braid. The basketweave comes out so beautiful and I really enjoyed working on it; I took my time and I'm pleased with the result. Finally we added our flowers and had the option of writing on the cake if we wished. The flip side to all this work is that it was a significant mess and clean up took longer than anyone really wanted it to. But we still managed to get out of there before the next class started! This looks great. 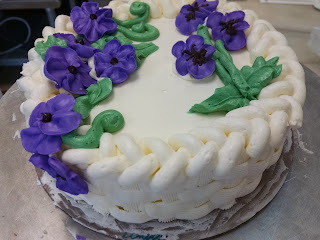 I have had my fun with cake decorating but the buttercream ones were definitely harder than the fondant. Yours looks great (I haven't tried basket weave yet)!